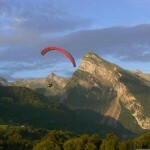 Test the incomparable thrill of paragliding to make his dream of Icarus! 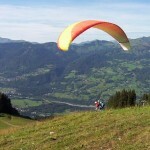 Paragliding in the mountains in the Haute Savoie, on the Grand Massif, is accessible through baptisms paragliding and paragliding training to all members of the family, from young children to older people. You will discover the majesty of our mountains and river Giffre the bottom of the valley. The regulars of the discipline regularly found on sites off, where you can witness their departure!